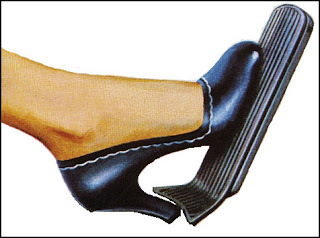 But how to manage that pesky notion of “tapping your feet”? It doesn’t have to be the feet, by the way; if you feel the pulse of the tune strongly enough, you will move whatever is most natural to you. Notice what you move when you are listening to any music with a strong beat. 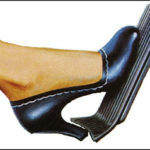 Tapping your feet should never be a task added to your mental list (yet another thing to unnecessarily overload the mind). Thinking of it as an additional task to coordinate while playing, instead of as a natural movement, is why many people find it difficult and shy away from it. And yet, tapping the foot to music is totally natural to everyone. If you aren’t so sure, just think about how you use the accelerator in your car. Is that an additional task to remembering to steer, control wipers, turn signals, shifting — or is it totally natural for you to step on the gas when you want to move the car? If you don’t drive, pushing the pedal of a bike is the same idea. You naturally move that foot on the gas pedal every time you want the car to move. Try feeling that motion when you play fiddle! One great compliment to a dance fiddler is that they can really drive the tunes. If you want that tune to move forward, step on the gas!